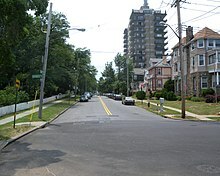 Rosebank is a neighborhood in the northeastern part of Staten Island, one of the five boroughs of New York City. It is bordered by Clifton to the north, Arrochar to the south, and the Upper New York Bay to the east. Originally called Peterstown, then called Clifton, Village of Edgewater, the name "Rosebank" appears to have been first used to denote the neighborhood around 1880. Before 1880, the area was the "Newport RI" of the USA. The area was home to great estates, some of the richest families in the country had mansions along the shore and inland. The New York Yacht Club summer house was (still stands) next to the Alice Austen House. The Vanderbilts, Aspinwalls and Townsends built and attended St John's Episcopal Church. The first baptism at that church  was Cornelius Vanderbilt II, whose father donated Vanderbilt University. The big farms and estates were divided up into small parcels and soon after 1880 Italian immigrants began settling there, and their descendants have continued as its predominant ethnic group, exemplified by the location of the Garibaldi Memorial in the community. The neighborhood once played host to a federal quarantine station for incoming immigrants (closed 1971), and was the home of noted photographer Alice Austen, one of Staten Island's most recognizable personalities of the past. The Garibaldi-Meucci Museum is named for a longtime resident, Antonio Meucci, who has some claim to having been an inventor of a working telephone. However, impoverished, he was unable to obtain a patent or to market it. When Giuseppe Garibaldi visited the United States while in exile from Italy, he stayed for a time at the home of Meucci. This home is now a museum named for the two men. In addition to the Garibaldi-Meucci Museum, the Elizabeth Alice Austen House, McFarlane-Bredt House, and Our Lady of Mount Carmel Grotto are listed on the National Register of Historic Places. In recent years the town has experienced an influx of other ethnic groups, including Eastern Europeans[who? ], various Hispanic nationalities[who?] as well as Asians, particularly from the Philippines. The age, density and architectural style of Rosebank's housing stock resembles that found in most of the island's North Shore neighborhoods; however, demographically Rosebank has more in common with such East Shore communities as New Dorp. As a result, there is considerable disagreement as into which region of the island Rosebank should be classified. Alice Austen (1866–1952), Photographer, who was a lifelong resident of Staten Island. Sir Roderick W. Cameron (1825–1900), shipping company owner. Nicole Malliotakis (born 1980), member of the New York Assembly and first Hispanic-American elected to a Staten Island district. The S52 and S78 local buses travel on Tompkins Avenue, and the S51 and S81 buses serve Bay Street. It is also served by the SIM1, SIM7 and SIM10 express buses to and from Manhattan on Narrows Road North. Starting in August 2018, express bus service to and from Manhattan is also provided by the SIM30 route. ^ Wilson, Claire. "Living In | Rosebank, Staten Island: A Quiet Slice of New York Waterfront", The New York Times, March 12, 2006. Accessed November 3, 2007. "In July, the same group holds a picnic and concert with an 18-piece band on the grounds of Clear Comfort, the former home, now a museum, of Alice Austen, a native Staten Islander who was a pioneering female photographer." ^ Padnani, Amy (November 3, 2010). "Nicole Malliotakis, an upstart from Rosebank, runs roughshod over Assembly incumbent". Staten Island Advance. SILive.com. This page was last edited on 19 March 2019, at 01:43 (UTC).